For a true Western-style vacation experience, it's hard to beat the Flying L Hill Country Resort. Located in Bandera, Texas, the acclaimed Cowboy Capital of the World, the Villas at Flying L resort complex is the perfect vacation getaway for those who enjoy horseback riding, outdoor barbeques, nightly Western entertainment, and world-class golf. All this is in the heart of the Texas Hill Country, one of the most scenic regions in the Lone Star State. Beautifully furnished villa- and cabin-style guest units are surrounded by lush landscaping, a miniature golf course, and water park. Nearby the resort is a world-class 18-hole golf course, wildlife refuges, and horseback riding trails. Better than a dude ranch, the Villas at Flying L resort is the place where true vacation memories are made. Best of all, the units are privately owned, meaning that you can buy a timeshare directly from an owner at a discounted price here on the timeshare resale market. The small cabin units at Villas At Flying L are furnished with a queen bed and smaller bunk bed, have a kitchenette with microwave and refrigerator, and feature cedar wood interior walls. 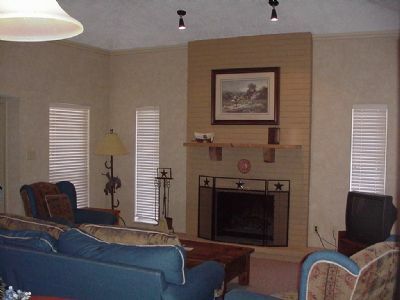 The two-bedroom villa units have one king bed and two queen beds, kitchenette, and wood-burning fireplace. These spectacular units were designed by none other than Frank Lloyd Wright. The Ranch Suite units are located by the water park or next to the golf course and feature a king bed, sofa sleeper, and loft bunk. 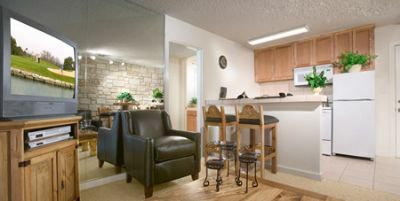 These units have a complete kitchen, separate dining area, full bath and shower, and washer/dryer. Lapham's Lodge is a group activity lodging facility that contains 10 bedrooms, sleeps up to 22 individuals, and contains a full-service kitchen, group dining area, and game room. Kids will love the privately owned water park, adjacent to the Ranch Suite units. The huge barbeque area is alive with entertainment each night, and the whole family can take part in potluck-style dinners while enjoying Wild West Shows. The 18-hole Championship golf course is open to guests and current timeshare owners. Nearby are several horseback riding operators who rent all necessary tack and other equipment. Fishing on area lakes is another popular activity for guests. Suites at the Villas at Flying L are privately owned, so membership and access to resort amenities is guaranteed when you purchase one of these Texas Hill Country timeshares for sale. Contact Villas at Flying L Specialist Today!